Its main exports are fish, sakau, betel nuts, and black peppers. Its major imports include food, beverages, clothing, and computers. Located in Oceania, Micronesia is an island nation. It has a 6,112.00 km coastline. The capital city of the Federated States of Micronesia is Palikir which has a population of approximately 4,645 residents. The city, which has served as the capital since 1989, is located in the northwestern portion of the island of Pohnpei. After gaining its political independence the local government of Micronesia decided to convert Palikir into its present form and establish it as the region’s administrative and capital city. Most of the local residents live off the land and sea as farmers or fisherman. Palikir is not Micronesia’s largest city but it is home to the Chinese Embassy as well as the College of Micronesia. Most travelers venturing to Palikir typically do so in order to enjoy the region’s tropical rainforest climate and natural habitat. Micronesia is an Oceanian country covering 702.00 km2. The area includes Pohnpei (Ponape), Chuuk (Truk) Islands, Yap Islands, and Kosrae (Kosaie). This makes it the 20th smallest country in the world and about 18 times smaller than Connecticut. Its geographic coordinates are 6 55 N, 158 15 E and Palikir is the capital city. The name "Micronesia" is a 19th century construct of two Greek words meaning small and islands. Its ISO code is FM. Micronesia has a mean elevation of 0 m above sea level. It has a tropical climate with heavy rainfall year-round. Its terrain varies from high mountains to low, coral atolls. Micronesia has a population of 104,719 making it the 192nd largest in the world. English is the official and most commonly spoken language. The major ethnic groups reported are Chuukese, Pohnpeian, and Kosraean. The majority of the population is either Roman Catholic or Protestant. 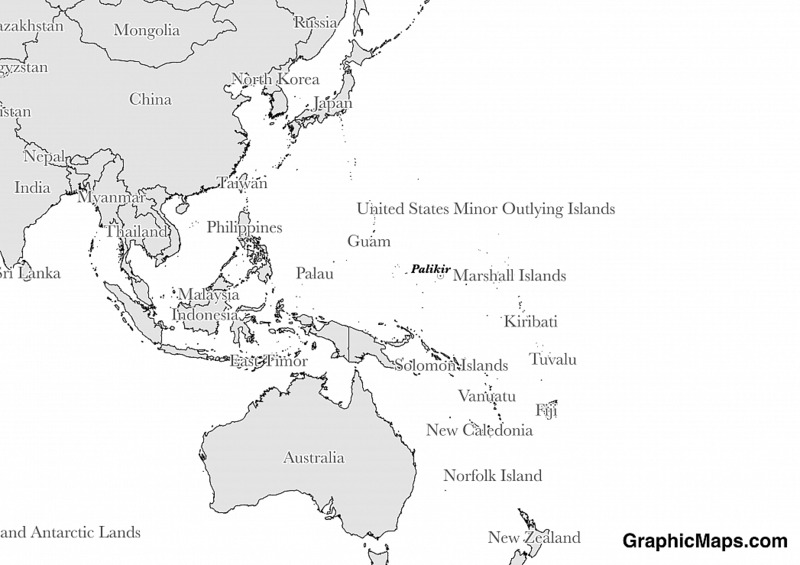 Although the official language of the Federated States of Micronesia is English the majority of the local population speaks a variety of regional languages. While there are approximately twenty Micronesian languages the most widely known include Chuukese, Kosraean, Pohnpeian, Yapese, Ulithian, Woleaian, Nukuoro, and Kapingamarangi. The number of Micronesian citizens who speak these languages ranges from about 860 to 51,000. Pohnpeian, one of the most well-known of these native languages, features a vocabulary that includes the word, “Iao”, to mean light. To inquire as to someone’s name is to ask, “Ia edomw?” Due to the fact that some of these languages are only spoken on small isolated atoll regions as well as the cultural influence of the United States it’s feared that in time many native languages, such as Ngatikese, will become in danger of dying out. The dialing code for the country is 691. Micronesia is an independent country. It gained independence from US-administered UN trusteeship. Its constitution was last ratified in 1978. The Federated States of Micronesia consists of a large group of islands in the western Pacific Ocean. The government operates under a parliamentary republic system within a non-partisan democracy. Despite becoming independent and sovereign as specified in the 1986 Compact of Free Association Micronesia is also an associated state of the United States. The President, a position currently held by Peter Christian, is the official head of the state and government. The business of running the country is conducted in the Congress building which is located in Palikir, situated on the island of Pohnpei. Four senators are elected from each state with the remaining ten representing single member districts. The currency of Micronesia is the Dollar (USD). 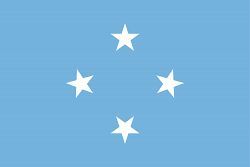 The Federated States of Micronesia officially adopted its current flag on November 30, 1978. The design features a light blue background symbolizing the Pacific Ocean where Micronesia is located. In the center of the flag, in a diamond shape, are four five-pointed white stars. These elements symbolize the four states which make up the Federated States of Micronesia, specifically the islands of Chuuk, Pohnpei, Kosrae and Yap. Before its current flag was utilized as its national symbol Micronesia used several other flags including ones representing the Trust Territory of the Pacific Islands as well as the flag of the United Nations and the familiar American stars and stripes.